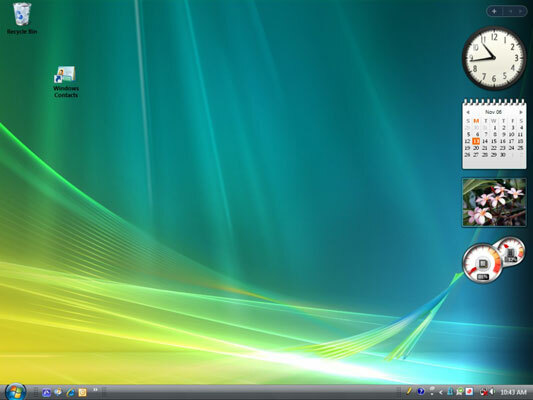 To help you work more efficiently, you’ll want to know how to create a desktop shortcut in Windows Vista. Think of your Windows desktop like your physical workspace. To keep your workflow efficient, you’ll want to keep the programs and files you need most frequently close at hand. 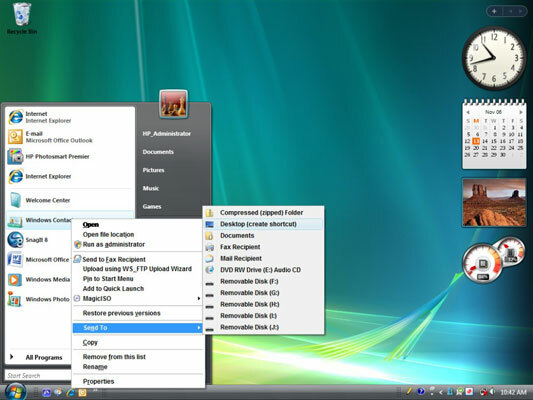 Creating desktop shortcuts for the programs and files that you use most frequently will help you access them quickly. Choose Start→All Programs and locate the program, file, or folder that you want to create a shortcut for. Right-click an item, Windows Contacts for example, and choose Send To→Desktop (Create Shortcut). The shortcut appears on the desktop. Double-click the icon to open the application. You can also create a shortcut for a brand new item by right clicking the desktop, choosing New, and then choosing an item to place there, such as a text document, bitmap image, or contact. Then double-click the shortcut that appears and begin working on the file in the associated application. For optimum efficiency, the desktop should be reserved for frequently used programs, files, and folders. Occasionally, Windows Vista offers to delete desktop icons that you haven’t used in a long time. Let it. You can always re-create shortcuts easily if you need them again. To clean up your desktop manually, right-click the desktop and choose Personalize. Click Change Desktop Icons in the Tasks list on the left. In the Desktop Icons setting dialog box that appears, click the Restore Default button, which returns to the original desktop shortcuts set up on your computer.